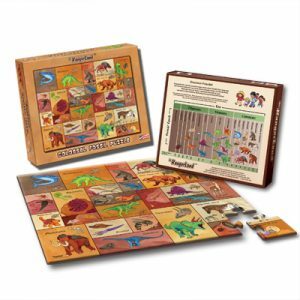 Assemble this colorful puzzle to learn more about fossils from long ago. Use the chart on the back of the box to see when these animals lived in North America. Although most of these organisms are extinct, you can learn about them by exploring the fossils they left behind. Product awards include: 2017 Creative Child Magazine Puzzle of the Year and 2017 Creative Child Magazine Product of the Year. Finished puzzle dimensions: 24″ x 18″, 48 large pieces. Ages 4 and up. Made in the USA.